Have you tried any of Fabric Mart's pre-cut fabrics? They have been such a remarkable deal that you can use them for experimenting with new trends, which is what I decided to do with mine! I had two woven prints in four yard cuts- one in white and grey, and one in blue and black. Four yards each is a lot of fabric! At first, I thought that I'd make two new Spring dresses, but at the last minute, I thought "Why not make four tops instead of two dresses?" Flounces, cropped pants, and asymmetrical hemlines are all trends that I wanted to try out this Spring. I thought of the white and grey print as my "test" fabric, as I liked the blue and black print more. So, I started out testing Vogue 9067 which is a very loose fitting top with hem and sleeve flounces. The sleeve flounces are doubled, so you don't have to hem them. I made a size smaller than my measurements would have indicated, and it is still quite voluminous. 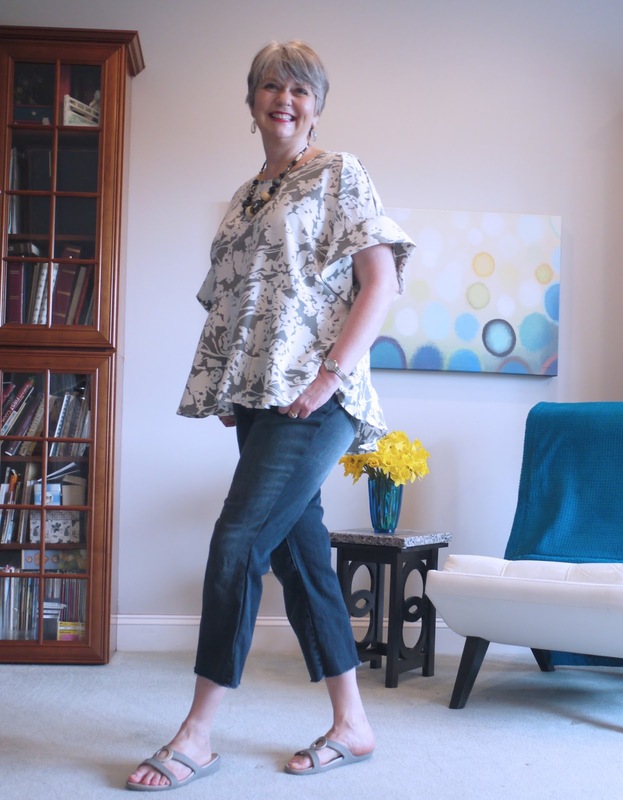 This was really easy to sew, and if you like this look, rest assured that it doesn't take nearly as much fabric as the recommendations tell you! I do like it, but wasn't sure that I liked it enough to make it out of the blue and black print. So, on to test top #2 from Butterick 6456, a top with multiple sleeve options and a front pleat. 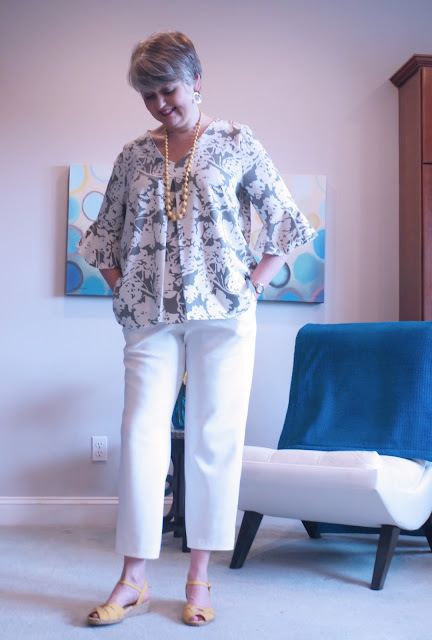 I chose the mid length sleeves with the flounces- they have just enough flare to be fashionable, but they are not long enough to get in the way. This style I liked a lot better than the first top pattern. The only downside is narrow-hemming that small circular flounce for the sleeve was a bear! 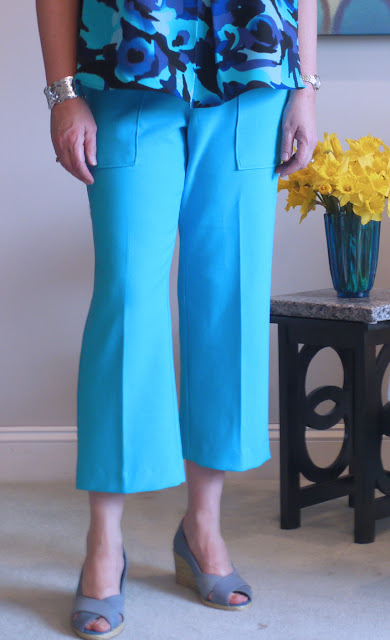 I also made these pants from a white ponte knit, using the pattern from Pamela's Patterns- Pants Perfected. This is an interesting pattern because it includes a DVD that you can watch on how to do things like fly zippers and mock welt pockets. Pamela does a great job of explaining things, and her sizing is very generous, which is great for larger ladies. I really liked the crotch curve on this pattern, and applied the curve to my next pairs of pants as well. So, here is Butterick 6456 in the blue and black print. Sometimes I can get away without doing a full bust adjustment, but in making the test version, I could see that I needed one, as well as a couple of other adjustments- shortening the v-neck and a forward shoulder adjustment. See how the lower front curves upward in the grey and white print? And see how it's pulling a little bit at the armholes? Doing the full bust adjustment fixed both of those problems. The white and grey one is definitely still wearable, and probably no one but me would notice, but I feel better having done it. I have however changed my mind, and now prefer the grey and white print, so I wish I had reversed the order in sewing them! 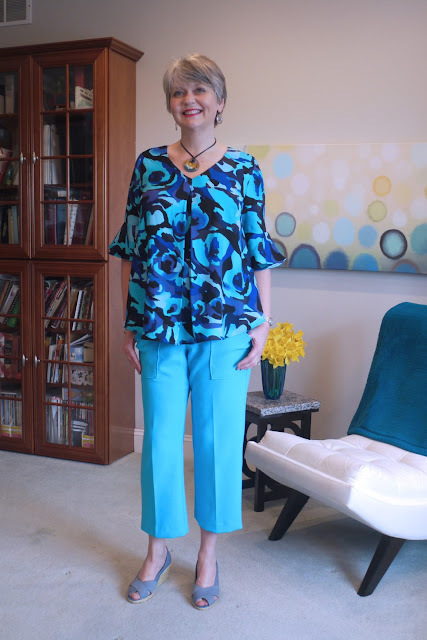 For the cropped, slightly flared pants, I used a Shoshanna light blue stretch suiting fabric (now sold out) and Simplicity 8264. I'm not sure if these pants really work with the top- they are both pretty bold. I'd be interested to hear your opinions on this. For fitting, I laid the pattern for the back pants piece crotch curve over the Pamela's patterns version, and blended Pamela's curve into this pattern. It worked great, and I think that this will be the way that I can get a better fit with other pants patterns, but still incorporate the details like leg circumference and flare from the other patterns. I like the gentle flare on the legs and the pockets on this one, but I don't care for the center back zipper. I would move that to the side if I make these again. Also, be warned- I think that these need a stretch fabric, even though the pattern doesn't indicate that. I still had plenty of the blue and black fabric left, so I chose one more pattern- McCalls 7579. This is a pattern for both a top and close fitting pants from Nicole Miller. In the pattern, the top is actually cut into many different sections,but I didn't think that the seamlines would be noticeable with my printed fabric. So, I loosely pieced the pattern pieces together on my cutting table, as well as I could, and then traced a one piece front and a one piece back. It worked, and was a whole lot easier than sewing all of those sections together! I also simplified the pants by extending the upper edges 1-1/2 inches, and then making an elastic waist instead of a separate waistband and zipper. 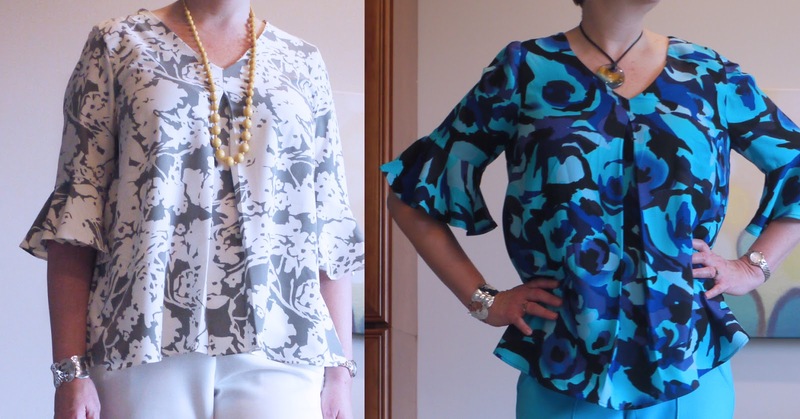 I used ponte knit for these too and Pamela's Fantastic Elastic, so comfortable! You can see the interesting pant seam lines a little in the photo. I do see that they are bunching up around the knees in the photo, so I think that means I need to tighten it up in that section so there isn't excess fabric. The top is very dramatic, and perfect for a flowy fabric like this one. I definitely want to try the pieced version out of a solid silk, now that I know that I like this style on me. 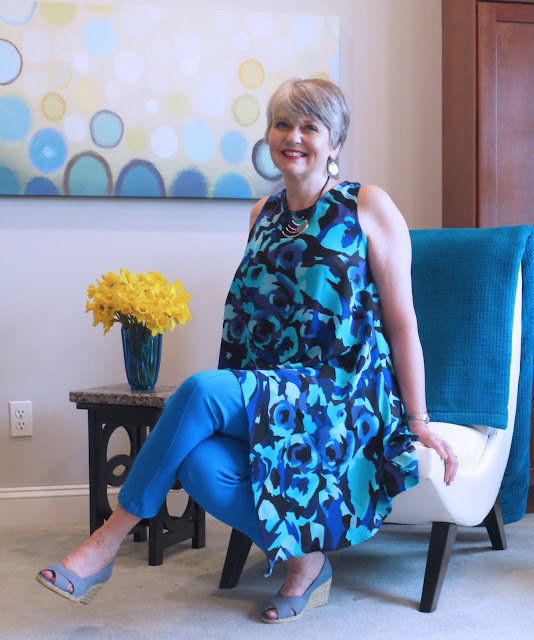 That's what I like about using the pre-cut fabrics- you can try out a style inexpensively, play with alterations or variations, so that you can be much more confident when you are ready to cut into a pricier fabric. I really enjoyed working with these pre-cut fabrics, trying some trendy patterns, and I have several more to sew up as well. How about you? Have you succumbed to the call of the pre-cut fabric specials? Love all four of your looks! Especially the last photo, beautiful! I love all of these & no, none of these outfits are "too much". Very professional & pretty - looks like something you would get from a high-end boutique. Thanks, Teresa! I appreciate your input! This was a very helpful article. I haven't made anything to wear for years because I can't imagine what it will look like on me when I am done and didn't want to waste my money on a test garment. (At 64 my figure has changed dramatically.) You've managed to make it less of a risk and you look great in your new creations! I need to start experimenting. Thank you! As long as you enjoy the process, then it's never a waste of time. I sometimes don't end up with a garment that I can wear, but I always enjoy the experience and usually learn a thing or two. Lovely tops, you did a great job! EVERYTHING is BEAUTIFUL!the MODEL and the CLOTHING! Wow, thanks! You made my day! I love all of these tops especially the ones made from the blue floral precut! I'm wondering how I missed that one cause I've bought quite a few of those precuts! Thanks, Carolyn. You know, you have to be on your toes with FabricMart! I've seen you make many things and have said, now why didn't I see that fabric?! Beautiful job. Will your daughter try to borrow these? Your work and your writing are top notch. Haha! I'm sure that she would if she could! It will be another year before she comes home from the Peace Corps, so she'll have to wait. Thanks! Great article and great looks. Enjoyed every word and picture. Thank you! How cute! I love all of your looks! Great post Ann! 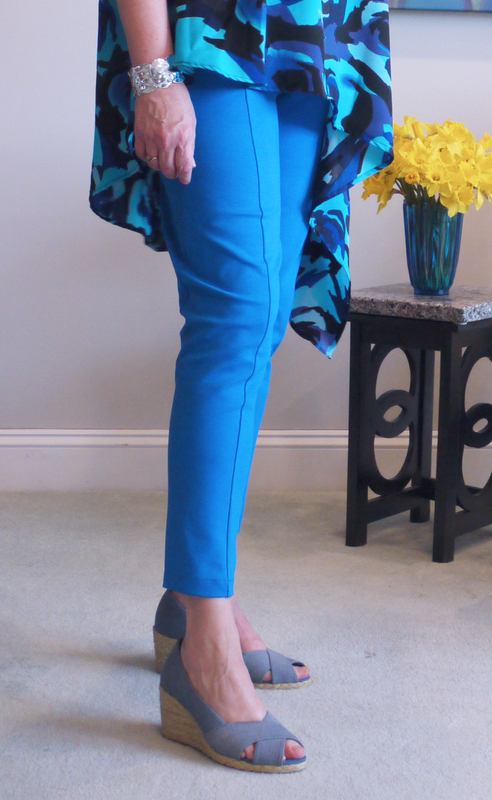 Really love the blue and black fabric tops the most, pants look great and may have to give this pattern a try. What a great idea to use precuts to make samples. I love each look. Very nicely made and stylish. I just absolutely love the asymmetrical top. I have to buy that pattern for sure. You look lovely! Thank you! I just ordered a bunch more while they still have the pre-cuts! Wow wow wow! You look beautiful! That blue and blue combo is just so outstanding....where is it? The gray and white is beautiful but the bright turquoise pants and the blue print is just....AMAZEBALLS!!!!! Thanks, Colleen. Unfortunately the blue print has sold out. But cross your fingers that they'll get some equally amazing prints to replace it! 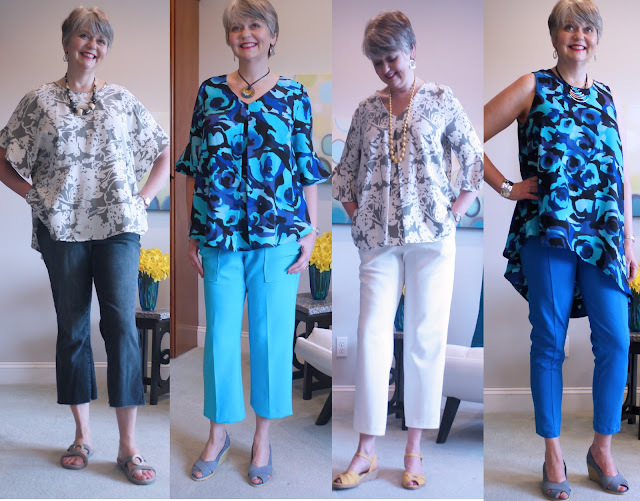 Your posts are always a treat because you provide lots of options!That big blue floral print is right up my alley!! I just discovered the great deals available from Fabric Mart's pre-cut fabrics, too. What you made looks wonderful on you, and you're inspiring me. Thanks so much for sharing! My pleasure! I hope that you enjoy working with them. Your before and after fitting tweaks on B6456 really illustrate the need for a good fit in key areas like bust and shoulders, even on loose fitting garment. I will have to remember that when I consider skipping them on one of my sewing projects. 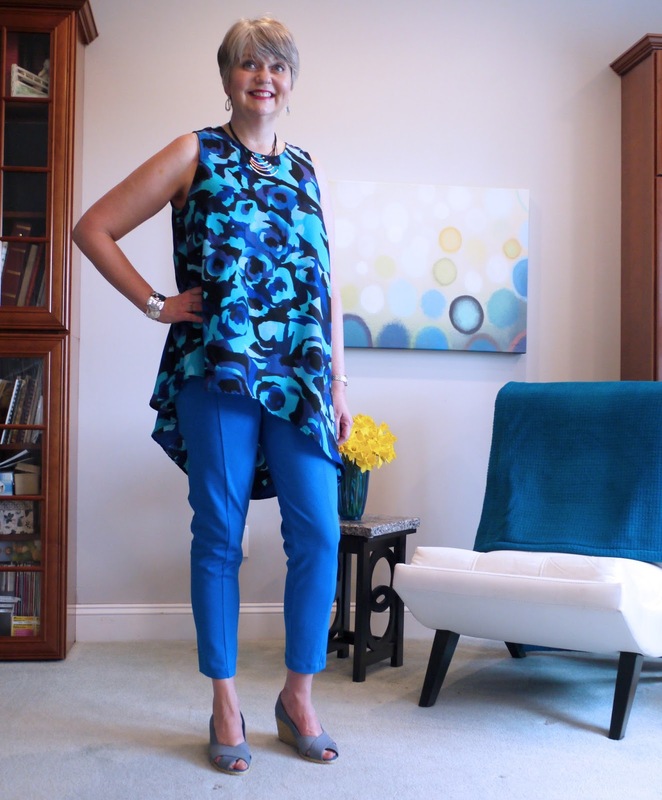 All tops and pants look great on you, but my favorite is the blue print sleeveless asymmetrical top and tapered pants. It is a really chic, casual summer outfit. Thanks, Audrey. I know, I'm so lazy when it comes to making FBA, but they really do make the garments fit so much better, that I need to get better at making myself do them.